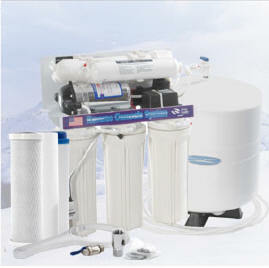 Every home needs a water purification system. No one should be drinking raw unfiltered tap water or living on inferior expensive bottled water. For those on a budget, you can easily build your own water purifier system over time, unit by unit. Our standard flow through housing units are modular. One can be easily connected to the next with a simple double-threaded connector. Only the first step needs to include a spout (counter top models) or a faucet (under sink models). You can start with as little as a single housing containing a multi-stage cartridge (with either 6 stages or the 7 stage version that includes fluoride removal). Then later a second housing with a solid carbon cartridge can be added to go in the first position. Or you could start with a dual system and expand from there. For under sink models, a mounting bracket appropriate for the number of housings will come with each purchase so you can mount them side by side and attach them with the connector. Make your choice for a starter unit below either counter top or under counter, single or dual. Then return to this page to order your additional items when you are ready. Be sure to make note of the cartridge replacement suggestions and get your replacement cartridges at appropriate intervals. Those are found on the Replacements page. Single Multi 6-Stage Counter Top Flow Through Water Purifying System -- Standard housing about 5.25 in. wide including spout; "Smart" multi 6-stage filter cartridge: 1 micron pre-filter, ERA-6500, ERA-9500, Granular Activated Carbon (GAC) , ion exchange resin, ion exchange resin, 1 micron post filter. For city water that is NOT fluoridated. Capacity: 6,000 to 8,000 + gallons -- change every 1 to 2 years (depending on sediment). Includes stainless steel diverter valve & inlet hose, plus stainless steel spout attached to housing. 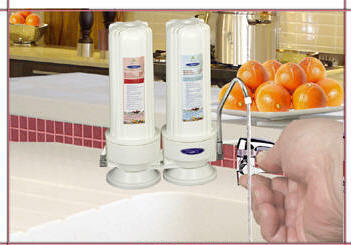 Dual Multi-Stage Counter Top Flow Through Water Purifying System -- Two standard size housings, about 10 in. wide including spout, containing: 7 stages of filtration: solid carbon block (1st housing) (change every 1 to 1 1/2 years); "Smart" multi 6-stage filter cartridge (2nd housing) (change every 1 to 2 years): 1 micron pre-filter, ERA-6500, ERA-9500, Granular Activated Carbon (GAC), ion exchange resin, ion exchange resin, 1 micron post filter. For city water that is NOT fluoridated. Capacity: 8,000 + gallons. Includes stainless steel diverter valve & inlet hose, plus stainless steel spout attached to 2nd housing. Single Fluoride Removal Counter Top Flow Through Water Purifying System -- Standard housing about 5.25 in. 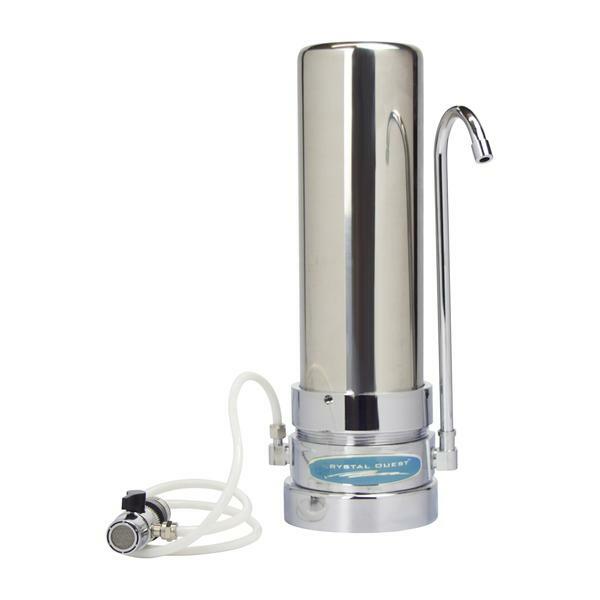 wide including spout; 7 stages of filtration: "Smart" multi 7-stage fluoride removal cartridge: 1 micron pre filter, special fluoride removal media*, ERA-6500, ERA-9500, Granular Activated Carbon (GAC), ion exchange resin, 1 micron post filter. For city water. Capacity: 2700 ppm fluoride, approx. 1,500 gallons -- change every 1 to 1 1/2 years. Includes stainless steel diverter valve & inlet hose, plus stainless steel spout attached to housing. Dual Fluoride Removal Counter Top Flow Through Water Purifying System for Fluoridated City Water -- Two standard size housings, about 10 in. 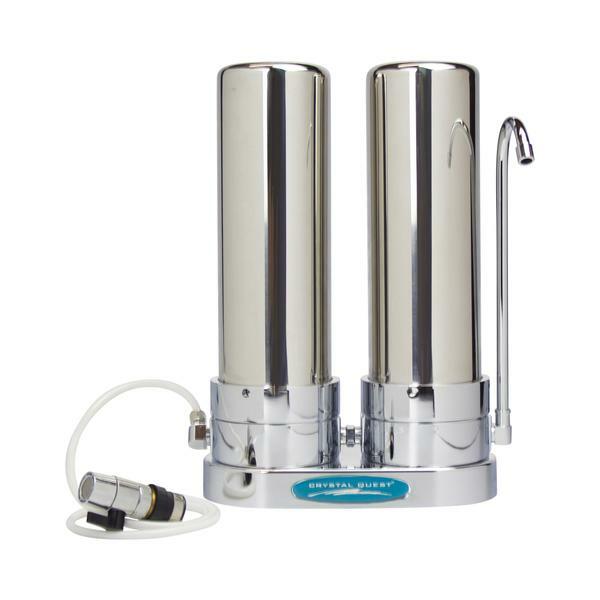 wide including spout, containing: 7 stages of filtration: special cartridge* for maximum removal of fluoride, lead and arsenic (1st housing) (change every 1 to 1 1/2 years); "Smart" multi 6-stage filter cartridge: 1 micron pre-filter, ERA-6500, ERA-9500, Granular Activated Carbon (GAC), ion exchange resin, 1 micron post filter (2nd housing) (change every 1 1/2 to 2 years). For city water. Capacity: 4500 ppm fluoride, approx. 2,500 gallons for fluoride cartridge, approx 8,000 gallons for Multi 6 Stage. Includes stainless steel diverter valve & inlet hose, plus stainless steel spout attached to 2nd housing. Single Multi 6-Stage Under Counter Flow Through Water Purifying System -- Standard housing about 4.5 in. wide; "Smart" multi 6-stage filter cartridge: 1 micron pre-filter, ERA-6500, ERA-9500, Granular Activated Carbon (GAC), ion exchange resin, 1 micron post filter. For city water that is NOT fluoridated. Capacity: 8,000 + gallons -- change every 1 1/2 to 2 years (depending on sediment). Includes valve to tap into cold water line, counter top faucet for edge of sink, and washers, hoses, etc., for installation. Dual Multi-Stage Under Counter Flow Through Water Purifying System -- Two standard size housings, about 10 in. wide total, containing: 7 stages of filtration: solid carbon block cartridge (1st housing) (change every 1 to 1 1/2 years); "Smart" multi 6-stage filter cartridge (2nd housing) (change every 1 1/2 to 2 years): 1 micron pre-filter, ERA-6500, ERA-9500, Granular Activated Carbon (GAC), ion exchange resin, 1 micron post filter. For city water that is NOT fluoridated. Capacity: 8,000 + gallons. Includes valve* to tap into cold water line, counter top faucet for edge of sink, and washers, hoses, etc., for installation; plus bracket for mounting under sink. Single Fluoride Removal Under Counter Flow Through Water Purifying System -- Standard housing about 4.5 in. wide; 7 stages of filtration: "Smart" multi 7-stage filter cartridge: 1 micron pre filter, special fluoride removal media*, ERA-6500, ERA-9500, ion exchange resin, Granular Activated Carbon (GAC), 1 micron post filter. For city water. Capacity: 1,500 gallons -- change every year or so. Includes valve* to tap into cold water line, counter top faucet for edge of sink, and washers, hoses, etc., for installation; plus bracket for mounting under sink. Dual Fluoride Removal Under Counter Flow Through Water Purifying System -- Two standard size housings, about 10 in. 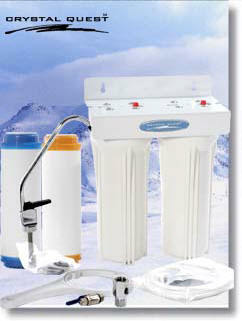 wide total, containing: 7 stages of filtration: special cartridge* for maximum removal of fluoride, lead and arsenic (1st housing) (change every year or so); "Smart" multi 6-stage filter cartridge (2nd housing): 1 micron pre-filter, ERA-6500, ERA-9500, Granular Activated Carbon (GAC), ion exchange resin, 1 micron post filter (2nd housing) (change every 1 1/2 to 2 years). For city water. Capacity: 4500 ppm fluoride, approx. 2,500 gallons for fluoride cartridge, approx 10,000 gallons for Multi 6 Stage. Includes valve* to tap into cold water line, counter top faucet for edge of sink, and washers, hoses, etc., for installation; plus bracket for mounting under sink. Solid Carbon Block Water Purifier -- Add-on to an existing Standard Counter Top Unit. -- Standard housing about 4.5, in. wide, with connector and solid carbon block cartridge (change every year). 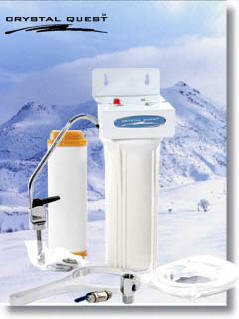 Solid Carbon Block Water Purifier -- Add-on to an existing Standard Under Counter Unit. -- Standard housing about 4.5 in. wide, with connector, bracket and solid carbon block cartridge (change every year). 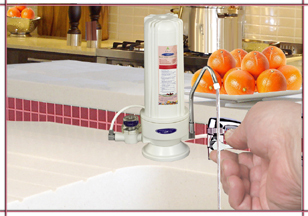 Fluoride Removal Unit As Add-on To Counter Top System -- Standard housing about 4.5 in. wide, with replaceable special cartridge* for maximum removal of fluoride, lead and arsenic (9 3/4" long, diameter about 2 7/8 in. -- capacity: 4500 ppm fluoride (approx. 1,500 gallons) -- change every year). Includes connector to add-on to existing standard heavy duty system. Fluoride Removal Unit As Add-on To Under Counter System -- Standard housing about 4.5 in. wide, with replaceable special cartridge* for maximum removal of fluoride, lead and arsenic. (9 3/4" long, diameter about 2 7/8 in. -- capacity: 4500 ppm fluoride (approx. 1,500 gallons) -- change every year). Includes connector to add-on to existing standard heavy duty system. IF YOU WANT TO PAY BY PHONE using either your checking account or a credit card or debit card, call us toll-free at 1- 800-542-1923 (10 am to 5 pm Eastern Time, Mon-Fri).